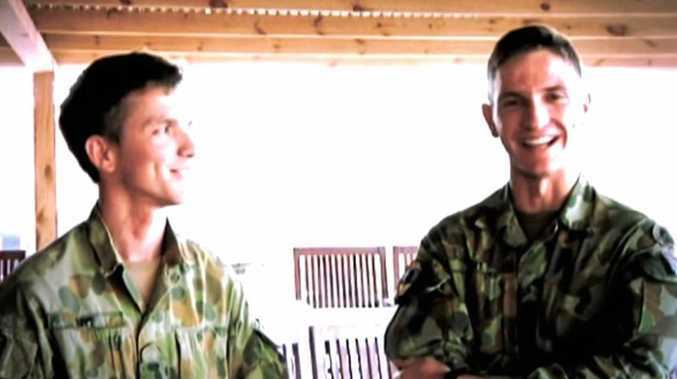 AFTER a exhausting and successful fight with up to 20 men on the ground using wet hessian sacks to save Ross McClymont's house on Wednesday, the fire returned a bitter blow on Thursday. 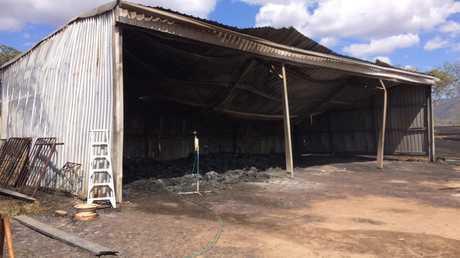 The grazier and hay farmer's shed could not be saved, with 70 bales proving the perfect fuel to melt the large 20m steel structure when the fire viciously flicked back around late Thursday. 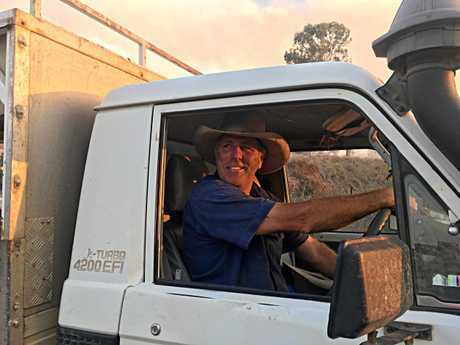 Woolooga shed fire : This Woolooga farmer got hit by the raging bushfire a fourth time. 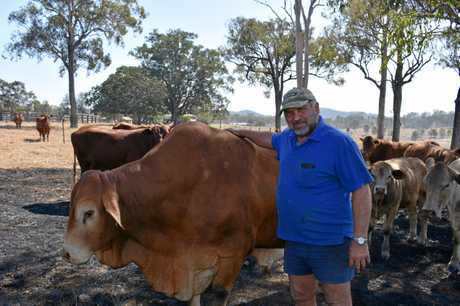 Mr McClymont was at his neighbour's house, furiously helping while the fire tore through grazing property there, when his wife at home called. He could see the flames, but was stuck. Three men who had been working on his house managed to save Mr MClymont's tractor, using a four wheel drive to drag it form the burning shed. "There was 100l of diesel up there and the fuel filler was in a melted pile on the ground," he said. "That's how hot it got." It was the second time the fire reared its head at the 120 acre property, before it flared up again late Thursday and yesterday. Standing in his burnt out fields, he was sure the wind would bring it back a fifth time and reduce his remaining paddocks to ash. The Woolooga fire said it was unstoppable and he could not leave his property with the ridk of flying embers or change in wind direction. "If you're in front of it - you won't beat it - it's that fast," Mr McClymont said. "All you see is just the yellow of the flames going through. "You've got wind going that way, now today it's coming back at us. "You don't know where the bloody thing is going. Mr McClymont estimates his damages are at $50,000, but said insurance would save him. "Anyway when it's all over we'll have a drink," Mr McClymont said. "The pub's still there, thank God. I haven't even seen it for a week." 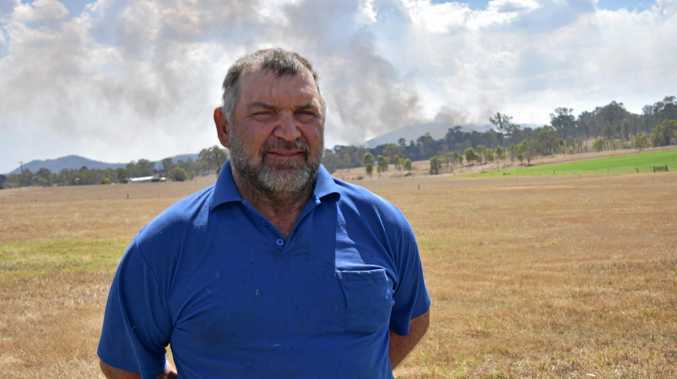 WOOLOOGA grazier and hay grower Ross McClymont watched 40 of his acres disappear in 15 seconds on the first day of the Woolooga bush fire. Mr McClymont was furiously trying to create a fire break on Wednesday while up to 20 men beat at the relentless fire with wet hessian sacks, fighting a blaze that 15 minutes earlier was a safe distance from the property. 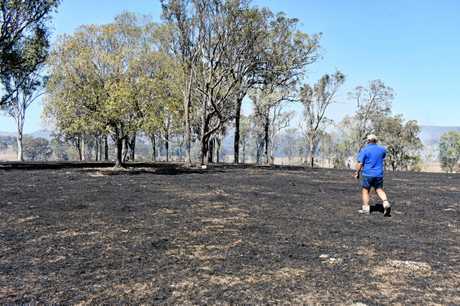 "At 1pm I went over to shift irrigation and it was burning up the hill," he said. "And then within quarter of an hour it was at the fence." "Even the dirt was on fire." Mark Hickmott helped save two houses from destruction at Pike Rd, Woolooga on Wednesday. Firefighters stopped the fire engulfing the Pike Rd property's hay shed, Mr McClymont said. "There were a lot of people here - when it got close to the shed that's when they all showed up," he said. "People come from everywhere to help. "It's good to have mates." The manpower stopped the grazier's house and sheds from disappearing, but ground, fences and a neighbour's tractor being used to fight the fire fell victim to it. "At least my babies are alright," he said of his herd that were shifted to safety. He worried though for a nearby neighbour, that had to put down burnt cattle this morning, he said. Reports came in earlier this afternoon that the fire returned to the property and burnt Mr McClymont's hay shed, but this could not be confirmed.